Star Cinema’s somewhat off-the-wall romantic comedy “Last Night,” starring two of ABS-CBN’s premier stars, Piolo Pascual (left) and Toni Gonzaga (right) will start screening this Friday, October 6, in theaters across the U.S. and Canada. The Philippines’ forever heartthrob Piolo Pascual and the multi-talented Toni Gonzaga reunite in Star Cinema’s latest movie, “Last Night,” which will screen in theaters across the U.S. and Canada starting this Friday, October 6, via TFC at the Movies. Pascual plays Mark, a businessman who has lost the will to live. Gonzaga is Carmina, a bright-eyed, idealistic young woman who has given up on life. Their paths cross during the lowest points of their lives. Believing they are on the last night of their lives, they make a pact that starts as a friendship and eventually blossoms into love. Gonzaga describes Carmina as a “very hopeful and curious” person until she reaches her ‘breaking point’. “Sometimes you feel you always have it together. But, in reality, you are really broken on the inside,” she explains. Pascual identifies with the humanness of Mark; he understands how Mark was at the end of his rope and opted for his last resort to end all his worries. “Last Night,” directed by Bb. Joyce Bernal, is the reunion project of Pascual and Gonzaga after their 2014 blockbuster hit “Starting Over Again” and it explores a different movie genre tagged as night romance – a tale of a dark, but hopeful, love story. “Last Night” director Bb. Joyce Bernal (center) explores a different genre: night romance – a somber, but hopeful love story – in her latest movie starring Piolo Pascual (left) and Toni Gonzaga (right). The film may be “dark”, but Gonzaga says it also sends a message of hope and love. “Mare-realize mo na ang sarap magmahal, ang sarap mabuhay, at ang sarap ma-experience ng buhay (It will make you realize how good it feels to love, to live, and to live life to its fullest. )”, she beams. Padilla echoes Gonzaga’s sentiments and added, “you want to give people hope; when there is darkness, there’s light. There will always be love”. Piolo Pascual (left) and Toni Gonzaga (right) are charismatic actors and the perfect match in “Last Night” – a peculiar love story that balances the eccentric and the sober in a life-affirming story that will take you by surprise. Are Carmina and Mark really set out for the last night of their lives? Will love be enough for them to hope and live again? 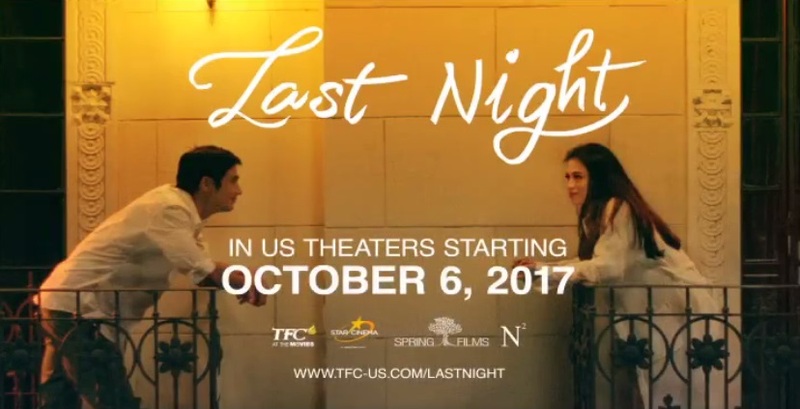 Find out in Star Cinema’s unconventional and quirky love story, “Last Night,” which opens this Friday, October 6, in the U.S. and Canada. Go to www.tfc-usa.com/lastnight and www.tfc-ca.com/lastnight for more information and to find a theater near you, or visit TFC US or TFC Canada on Facebook. Connect with fellow global Kapamilyas and follow @KapamilyaTFC and @KapamilyaGlobalPR on Twitter and Instagram.